Your strategy may be unclear or too vague to act upon. The solution to realise your strategy may be more difficult to implement than expected. Your solution may simply not deliver the expected results. Whatever the reason, the missed potential of not fully executing your strategy is high. The prize for closing the strategy-to-performance gap is huge—an increase in performance of anywhere from 60% to 100% for most companies. 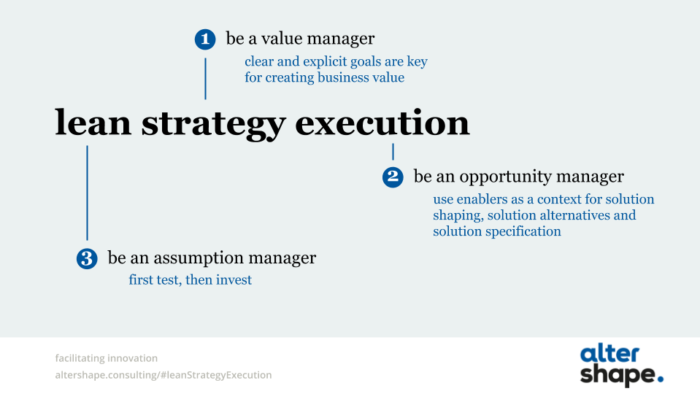 With lean strategy execution, I provide a straightforward scheme to validate your strategy and guide your execution process. A strategy needs to be specific, without stipulating a detailed solution. You should effectively be making choices. Don’t say “We will grow our revenue”, but rather say “We will grow our revenue through a better exploitation of our current product portfolio at our current customer base”. The opposite, developing new products or targeting a new customer segment, could also be a valid strategy, but it’s not the choice you are making. taking these learnings and refine the operationalisation of your strategy. There’s a fine balance to strike here to ensure your strategy is giving enough guidance towards implementation without restricting solutions early on. This is typically a field where business analysts can contribute a lot. But this does require the BA to take up some new roles: those of value manager, opportunity manager, and assumption manager. With these new roles, the BA will not only drive the classic analysis (“research and documentation” role) but also have a big influence on the iterative process to execute your strategy and turn it into operational success. 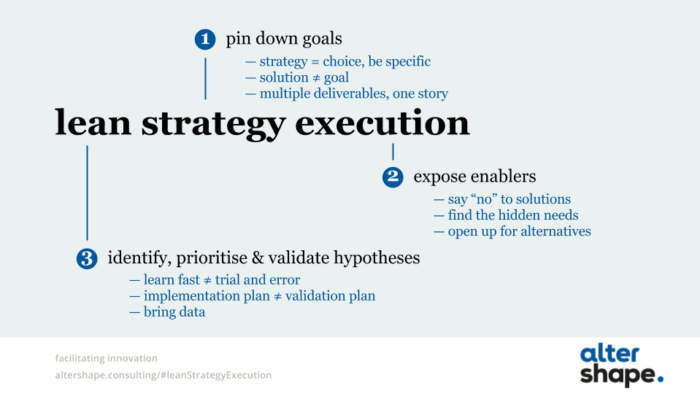 Want to get a better feel of the lean strategy execution scheme? Join my #BABeyond18 talk on Thursday 24 May. Want to dive in the details and try it out yourself? Then participate in my half day workshop on Wednesday 30 May at IT Works. I look forward to meeting you at one of these events!